This is a wonderful recipe for Boxing Day brunch as it uses up leftovers from the Christmas dinner. If you go easy on the butter it’s quite healthy, too. Heat a little oil and butter in a frying pan. Fry the garlic and onion for two minutes. Add the leftover vegetables and crush, then stir through the smoked fish. Heat through for three minutes. Add the herbs and season with salt and pepper. Mould the mixture into little patties. Heat a non-stick pan and add some oil. Fry the bubble and squeak until golden-brown all over. Drain on kitchen paper and keep warm until ready to serve. For the duck eggs, bring a large pan of water to the boil. Add a little white wine vinegar. Using the handle of a slotted spoon, swirl the simmering water to create a whirlpool (this will help the eggs to hold their shape). Crack the eggs, one or two at a time, directly into the centre of the whirlpool. As the eggs cook, use the spoon to keep the water moving and ensure the egg whites wrap around the yolks (do this carefully so as not to break the eggs). Poach the duck eggs for five minutes. Drain to remove any excess water. 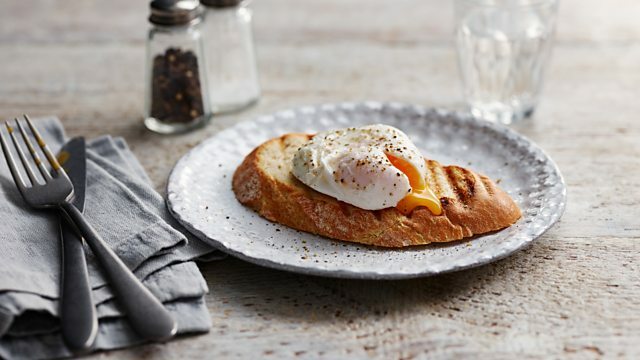 Serve a poached egg on each serving of bubble and squeak.